An untold story in the cruising world is the value that can be found in some older boats selling for modest prices.Well-built decades ago, boats priced at less than $150,000 today have the potential to be cruising for decades more as long as they continue to receive the care that has kept them going for years. PMM calls them "affordable boats,"but there&apos;s nothing secondrate or quality-challenged here.These trawlers make wonderful cruising yachts and comfortable liveaboards, and, over time, we&apos;ll review va rious makes and models of these so-called "affordable boats." We begin this new series with a look at the classic wood Grand Banks and Alaskans built by American Marine in the late 1960s and early 1970s.-BillP. BETWEEN 1965,WHEN THE FIRST GRAND BANKS SPLASHED INTO THE water at Hong Kong, and 1973,American Marine launched more than 1,400 GB and Alaskan yachts. An expert looking across a crowded summer anchorage can&apos;t tell the difference between a well-kept 1973 woodie and a 1993 fiberglass yacht. The company has made no major design changes since Ken Smith drew the lines for the first Grand Banks, a 36-footer, in the early 1960s. Today, the base price of a new 36 is $350,000.Taxes and commissioning easily will push the total to $400,000 or more.A 42 Classic-the famous tri-cabin-today has a base price of about $550,000. Larger engines, electronics, heat and air conditioning, and other goodies and taxes will kick the final price somewhere close to $625,000. Here&apos;s why woodies are interesting. A 32-footer of the teak-and-mahogany generation today will fetch between $40,000 and $60,000 depending on condition; when GB quit building the baby yacht a few years ago, it was priced at $200,000. A wood 36 Classic, with two staterooms, two heads, and a modestsized saloon, will range from $60,000 to $80,000; superb specimens will go for more. The 42 woodie will be priced from $100,000 to $125,000, depending on age and condition. Boost those prices by 30 to 50 percent, to cover work that may be needed to make the woodies near-perfect, and they still are affordable yachts costing $150,000 or less. American Marine built wood 48- and 50-foot GBs, too. 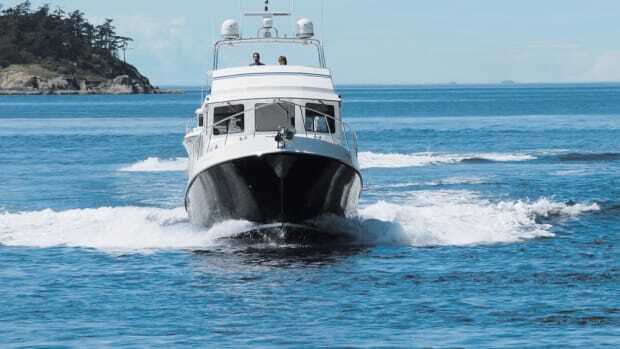 They are not often on the market and usually are priced in the range of $200,000/$250,000, well above our arbitrary price cap Those big yachts, however, along with the entire fleet of Alaskan pilothouse cruisers, represent the best on the market for those looking for a boat to live aboard. With large saloons and cockpits, galleys with home-sized appliances, ship-like pilothouses with watch berths and settees, and multiple staterooms and heads, the big GBs and Alaskans remain much in demand today, despite their age. When American Marine switched to fiberglass in 1973, it perhaps could not afford building molds for a fleet of GBs and for the bigger (at 46, 49, 53, and 55 feet) Alaskans. Perhaps the decision was to concentrate on the boat for which American Marine was best known-the Grand Banks. Whatever the reasons, American Marine missed a sure bet and a big market by dropping the Alaskan line. Others picked up the style, and Ocean Alexander and De Fever, among others, now produce boats whose styling comes directly from the Alaskans. The company is developing a new pilothouse boat, to be called the Aleutian. It has built a model, pictures of which may seen on the company&apos;s website: grandbanks.com. Construction has not been scheduled for the 64- footer, a yacht sure to cost close to $2 million, because the American Marine production lines in Malaysia and Singapore are booked solid with orders for new GBs and their sistership line, the East Bay. For most of us, it will not be an affordable boat. For those with a strict budget, or who don&apos;t want to spend that much discretionary income on a boat, the new GBs simply increase the lure (and the value) of the old woodies. Constantly rising prices for new boats enhances the value of wood GBs, too. These aging yachts sell for several times their original cost, and good ones will continue to increase in value. For those willing to search diligently, there are some great buys out there. Wait a minute. Wood gets old, it cracks, it rots, it needs paint and varnish. It takes expert skills to repair and paint a wooden boat, and if a boat is 30 years old its engine is probably shot. Wood boats can smell of mold and mildew, and diesel fuel that has impregnated bilge planks. On the other hand, advocates say wood boats are quieter and that wood offers excellent insulation. And, in an argument from the heart, they say that wood is real, organic, and living, not muck from the bottom of a chemist&apos;s vat. Most problems occur because a boat has been neglected, because it has not been painted and bedded, because window leaks have not been fixed, because its mechanical systems have not been upgraded and babied, because it has been ignored. Doesn&apos;t mean it&apos;s a bad boat. It does take more skill to paint a wood boat than to clean and polish fiberglass. However, once a wood boat has a tightly clinging coat of paint, once the hardware and deck fittings have been bedded, once corrosion control has been reestablished and once the engine room has been brought up to snuff, most of the problems that can damage a woodie have been brought under control. Ignore a new yacht for a year or two, and it will begin to deteriorate. The gel coat gloss will dim, colors will become chalky, brightwork will dry and crack, and the engine room equipment will suffer from a lack of use. It takes a lot of work to keep a fiberglass boat healthy, too. Starting from the top, trouble on a wood GB is usually first found in the plywood used to build the deckhouse. Water seeps in around windows, eventually causing rot in the plywood side walls. The brow of the bridge and bridge seats also are common problem areas. Penetrating rain causes some rot. On the bridge, the crew unwittingly encourages it. The seat boxes on the older GBs are not ventilated and lack the teak grates found on newer yachts. Wet docklines and life jackets tossed under the seats for storage are crammed into corners and hold moisture which, with no way to escape, is an added stimulant for decay. In the Pacific Northwest, rain drips in around poorly-sealed windows to create science projects in the side walls. In California and Florida, owners wash down their boats and then quickly cover them-in the interest of protection from the sun-with the same ill results. Cockpit lazarettes on the Classics and Europas harbor the bugs that cause rot. Throw in wet lines and fenders and other damp stuff and decay will show in the plywood base of the hatch cover, and possibly in soft planking at the transom corners. If owners have been overly zealous in deck cleaning, using coarse sandpaper and damaging chemicals too often, the teak planking may be worn. But it was such thick wood in the first place, the chances are that it still is okay. Thiokol caulking between the decks plank may be gone or cracked. If so, water may have penetrated into the deck&apos;s plywood base. Moisture also encourages decay in deck framing beneath the saloon door on 32s, in the bulwarks on some Alaskans, and at the point where decks change elevation. While the plywood deckhouse is vulnerable, the mahogany planking is virtually bulletproof. Seldom does a surveyor find decay in underwater planking, and when it does appear, it may be wood burn or electrolysis around a through-hull fitting and not true rot. Water leaking around the deck fill plates is equally destructive to the top of a fuel tank. The bonding system likely is tired. Limber chains probably are broken and the limber holes plugged with dirt. On some of the oldies, the chine block (timber framing at the chine, where bottom or deadrise planking meets the side of the boat) may pull loose from planks to which it is screwed. This is "one of the biggest ticket items to fix," says Bunker Hill, a Los Angeles-area surveyor with years of experience on wood boats. However, Hill adds, the chine block probably doesn&apos;t need fixing for boats that cruise peaceful, inland waters. Hill said chine block movement can be seen and felt in distortion along the line where the deadrise turns. From inside, it may be possible to see that a couple of bottom planks have pulled away from the chine log. Old Grand Banks usually have their original engines. Normally, it will be a 120-hp Ford Lehman diesel, although American Marine also used John Deere and Caterpillar engines. Even after 30 years, a yacht engine may have less than 6,000 hours of running time on the clock. That&apos;s not much for a block that could run 20,000 hours with good care and upgrades. Parts are available, although it may take some determined scrounging, particularly for the systems GB added to the Deere block it converted for marine use. American Marine unfortunately chose to install a marine version of the General Motors Toro Flow diesel, in V6 and V8, and turbocharged and naturally aspirated models. It was a truck engine that was not well accepted by the trucking industry. A Florida company called Daytona Marine added water-cooled exhaust manifolds and turbochargers (on some) and began selling the engines for marine use. While they performed acceptably well, and cranked out a lot of horsepower (250 for the turbo V6), the GM/ Daytona/Toro Flow engines today are obsolete. Parts are not available. Period. If a decent boat comes along with beat up, high hour Fords or Cats, or with one of the unfortunate Daytona conversions, a wise buyer would negotiate the price to a level that would permit installation of new engines. Obviously, anyone shopping for a woodie wants to identify problems BEFORE writing a check. The goal should be to minimize the size of the project by buying a boat that has had generations of loving care, or which has been brought back to life in a restoration. To find the best boat, a buyer should make some judgments: From a few hours poking around, one can almost always determine if a boat is a loser, or if it may be okay. If a GB passes that gut level test, then one must find skilled surveyors of wood boats, and the best engine surveyors, before making a final commitment. Once the boat is purchased, there may be a need for talented shipwrights, electricians and mechanics. May is the proper word. Not all old Grand Banks yachts are wrecks. Many have been pampered and/or lightly used. She&apos;s a 32-footer, built in 1973. One of the last woodies. Over 27 years she&apos;s had three owners. Spent nearly every night under cover, out of the rain that&apos;s so common in the Pacific Northwest. Keeper is owned by Denny Hostvedt, of Bremerton, Washington, a former naval shipyard engineer who now owns a custom wood-working business. He keeps her in a house at the Bremerton Yacht Club. A veteran boater, Hostvedt bought the GB nearly two years ago after being boatless for a while. "She was perfect," he says. "I had owned a 36- foot Monk for 30 years and I demanded perfection and looked for that. "I saw a lot of junk," he said of his six-month search for a small Grand Banks. He saw a newspaper ad for the boat, but thought it was pricey at $69,000. "But I went over and looked and my eyes fell out when I saw it." He made a low-ball offer of $50,000, then finally bought it for $60,000. "That was a little high, but I couldn&apos;t pass on the quality. Both the hull and mechanical surveys were good. The surveyor said the hull was one of the best he had seen." Encouraged by friends, I took a ferry to Bremerton to see for myself. Keeper looks new. Finding her was like stumbling upon a low mileage and cherry 1955 Thunderbird convertible up on blocks, under cover, in an air-conditioned barn somewhere in South Dakota. Her brightwork is flawless. The paint, smooth and shiny, is white on the hull and the famous Grand Banks beige on the deck house. The accent color might have been sea foam green; American Marine used it generously in those early years, too. The deck teak is smooth, showing no signs of wear or ill treatment. Inside, the fabrics and vinyl are fresh, clean, and original. Her owners have all been minimalists. She has a compass and a depth sounder. So, there are no holes in the headliner through which wiring once was routed. The teak panel provided by the factory for instruments (above the helm) is virgin territory. Hostvedt will keep it that way, carrying a hand-held VHF radio, and maybe, a portable GPS, on fishing trips and cruises in Puget Sound. He will install a fish finder, to improve chances of landing a salmon. The galley is forward on the port side, opposite the helm station. Settees face each other aft. Forward is the stateroom, with Vberths, and a small head with shower. The engine room is spotless and odor free. The 120-hp Ford Lehman diesel has only 3,000 hours on it; enough time to show modest use, but not enough to worry about wear. Care is apparent: the engine has a new exhaust system and heat exchanger. A 32 is small. She will sleep four, but two is best. The cockpit is a fine place to spend a balmy evening. Taller crew members need to remember to duck when stepping through the saloon door into the cockpit and when stepping down to the forward stateroom. But these little boats are not wimpy. They routinely cruise the Inland Passage of the Pacific Northwest, often reaching Southeast Alaska. Owners need to be weather wise, to avoid sea conditions that might test the boat&apos;s ability to fly. "For the two of us, my wife and I, it is an ideal boat," Hostvedt says. Indeed. Keeper rates an 11 on any 1/10 scale. Her owners deserve four gold stars for giving her wise and loving care for so many years. Hostvedt found his boat in a newspaper. That&apos;s a good place to start because many owners of lower-cost boats try to sell them without retaining a broker. Regional boating newspapers and niche magazines like PassageMaker are good sources, too. Grand Banks dealers should be consulted. They may have taken a woodie in trade and brokers often know where good ones are hidden, even if they have not been listed for sale. Dealers and their brokers also should offer valuable assistance in sorting the good from the bad. Another place to start is the Internet. Many GB dealers have gone online and list their brokerage boats on a web page. Yachtworld.com carries ads for hundreds of yachts. It will search for specific models of Grand Banks by size, geographic location, and cost. One recent quick check produced tips on several-dozen wood GBs. The listings often include photos, a full description of the vessel and, of course, the name of the selling brokerage. There are GB owners&apos; groups around the world. They often publish newsletters that include notices of yachts for sale. PMM lists many GB owners&apos; groups in each issue. Call. Build a network. Talk with owners of wood GBs and tell them of your search, give them your name, and ask to have it passed on to still more owners. Be patient. It may take months to find THE boat. John Shearer and Maureen Carr of Portland, Oregon, were dining in a restaurant on Seattle&apos;s waterfront more than a year ago while they talked about buying their first boat. Moored nearby was a 36-foot GB woodie. "I said, if we get a boat it has to be cute like that," she remembers. They talked to brokers and read up on buying boats. "We kept testing our mutual reaction to the Grand Banks," he says, "and we talked about whether we wanted to go fast. Then we found that a lot of sailors go on to GBs, and that confirmed it for us. "And then we couldn&apos;t find one." Finally, they made an offer on a fiberglass 1985 36-footer that was listed at $130,000. The deal didn&apos;t work, and they kept looking. "So we got this boat, and neither of us had a clue how to operate it or how to dock it," Maureen shared. "We are impulsive people and once we had decided we wanted it, we had to do it." It also was apparent it was a project boat, a fixer-upper. They were ready, however. The money they didn&apos;t spend on the fiberglass boat went into a rehab fund for the wood boat. "With wood, there is more maintenance," he acknowledges. "But that doesn&apos;t bother me, we are do-it-yourselfers." John and Maureen keep their boat in Seattle. Once a week they make the 150-mile drive from Portland to spend several days aboard Emerald Isle, working on and learning how to operate her. John talks with all kinds of people for advice: engine maintenance, wood repair, and paint, among the topics. He and Maureen never stop asking questions of dealers, repairmen, or other boat owners. "The network has been great," she says. They have been spending money, too. The engine room was a mess, plagued by leaking fuel. They spent about $10,000 for new injectors, new engine mounts, a heat exchanger, alignment, and Racor filters. They bought new electronics, including radar, autopilot, depth sounder, and radios. They replaced the heads, added a new and bigger alternator, and new batteries,. as well as a new galley stove, and new electrical panel. Late last year the boat went into a shed for a paint job, some woodwork and for replacement or refurbishment of the bronze through-hull fittings. The bill was about $30,000. They plan to do the exterior teak themselves, and John has already refinished most of the interior teak. Designers at Grand Banks for many years apparently didn&apos;t know that people liked to sleep together, so master staterooms on the 36 and 42s usually had narrow berths on either side. Unsatisfactory. Doing what others have done, John and Maureen had a shipwright enlarge the starboard side bed. Visit other 36 and 42 yachts and you&apos;ll see a variety of similar solutions to the odd bed arrangement: double beds on the center line, or athwartship, for example. (GB folks aren&apos;t that naive, however. The side bunks left the center of the stateroom open for access to the stairway leading up to a door through the aft wall of the cabin. That door was considered an emergency exit to the aft cockpit. John and Maureen have spent a lot, but not what the fiberglass boat would have cost. They believe they are still ahead. "We know the boat. We know what was done, and who did it, and that makes me feel good," John explained. "If we had spent $130,000 on the fiberglass boat we would have had to live with it the way it was." John and Maureen are budgeting boat ownership. They expect that every three to five years they will need to spend $5,000 to $7,000 on maintenance and repair. Jim Thiele is an engineer and designer, and owner of American Blimp Co. in Oregon, which really does build blimps. He also has refurbished a 1973 wood 36 GB, Black Opal. It is his first boat, and after an investment of less than $150,000, he believes he has a yacht that is better than most fiberglass GBs on the market today. "I&apos;ve been through just about everything possible with a wood GB," he told me. "I think my engineering and design background have allowed me to get into the details much farther than most owners. This has been both good and bad." He has replaced rotten window frames and decayed flybridge attachment cleats. He has repaired worn and leaking decks, replaced rusting fuel tanks, and added new paint and varnish. "I&apos;ve also installed modern electronics, replaced almost all of the mechanical parts except the windlass, and installed a hot water furnace. "I&apos;ve also upgraded and added lots of small things, such as a new engine room hatch, folding mast for my covered slip, a shower exhaust fan, intermittent pantograph windshield wipers, new AC and DC panels, new davits, a new galley sink with modern fixtures, and filtered drinking water." Plus new mattresses, new canvas "and so on and on..."
Restoration of Black Opal has taken four years since he found the boat in Long Beach, California. Her owner was ill and the boat had not been used in seven years. "She was inexpensive but had obvious cabin rot and deck leaks. Of course, we were naive boat buyers and totally underestimated what it would eventually mean," Thiele recalls. He worked on the boat in California for six months and then had it trucked to Portland, for two more years of work. Then they moved her to Seattle, for even more refurbishing. Repairing the teak decks was perhaps the biggest challenge. American Marine used teak 7/8-inch thick, but used bronze ring shank nails (not screws) to attach the teak to the underlying plywood. After the deck wore, the wood plugs were too thin to stay in place. The channels were only 1/4-inch deep, too shallow to hold caulk. While some contractors recommended covering the teak, Drew Bowen at Landfall Marine in Seattle came up with a plan that worked. The solution: Remove all of the old caulk, recut the grooves using a fairing batten and trim router. Recaulk. Remove nail plugs, using a drill to remove the nail heads, and a hollow screw extractor to pull the nails. Countersink and replace nails with screws. Plug all of the holes. "If it sounds like a lot of work, it is," Thiele says. "It cost about $7,500, but the decks are better than new and look great." One more helpful word from Thiele: "One thing I&apos;ve done very successfully during the restoration was to work alongside the professionals I hired. I&apos;ve been able to save money by doing some of the grunt work and I&apos;ve learned all the details of the systems they&apos;ve installed or worked on. "This puts me in a better position to maintain and repair these things on my own in the future. I&apos;ve also had the opportunity to learn the basics from some great craftsmen." Thiele adds: "I&apos;ve clearly gone farther with this boat than I started out to do, and have spent more money than I can sell it for. And yet I&apos;ve now got a great boat for under $150,000 that is clearly better than most of the 1980s fiberglass GBs I see for sale. "With the restoration complete, I think the maintenance costs will be competitive with a glass GB, given that the brightwork and systems are identical on both boats, and represent the biggest maintenance expenses. "Time will tell." Do listen to Scott Blake. He is an experienced GB salesman on the staff of Grand Yachts Northwest in Bellingham, Washington. He has spent the past two years restoring a 1966 32-foot GB (Hull #16 in the 32 line). That early model is easily identifiable. American Marine was using wire life lines instead of handrails that year. And the galley is aft near the saloon door. In 1967, the 32s had teak caprails and the galley was moved forward for good. His advice to those looking for wood boats: Buy for quality. Blake bought a basketcase for $15,000. By the time his restoration is complete, he will have $200,000 in the project. "I&apos;ve shown the boat to many customers and I tell them don&apos;t buy a project, pay a premium for the best," he says. "In general, if a buyer is not a hands-on person and doesn&apos;t have the time or skills, I tell them not to buy a project, but that if they do, be sure they have deep pockets." Those who hire shipwrights for restoration work should manage the project and maintain control and approval authority over everything that is done. Costs may soar out of sight if there is no owner control. Wood Grand Banks can be affordable yachts, he says. "Absolutely. But don&apos;t be in a hurry. If you do find one that fits, buy it. "Too often people want to wait and think about it, and then someone else will buy it." Blake keeps his project boat under cover. I asked if covered moorage should be considered mandatory for wood yachts. "Covered moorage is ideal," he answers. "But not mandatory." A boat that is properly painted and sealed can take the weather, but maintenance efforts and costs will be greater. Owners of wood boats need to be diligent in caring for them, he adds. "You can&apos;t walk away from it. You&apos;ve got to keep it painted." He has added many custom touches, including Corian countertops, a custom sink in the head, and deluxe fixtures. "I bought it knowing a lot was wrong," Blake says. "I thought that maybe I&apos;d spend $60,000 to $70,000, and after a bunch of work, it would be a nice 32. But as the boat was dismantled the work list lengthened, particularly as structural rot was found under the deck and on the flybridge. "It has really been fun though. My friends and clients have been having fun following it. "It will be a lovely little boat." Number One Ownership of La Buona Fortuna, a 46-foot Alaskan, has been a happy experience for Dan Roach, Ellen Roth and their son Christopher. They bought it five years ago in Los Angeles as a liveaboard, recognizing that it had some problems, but falling for its styling and accommodations. (Author&apos;s note: During my extremely brief tenure as a yacht broker, I helped Dan and Ellen find the Alaskan. We went to Los Angeles together for sea trials and surveys, and had a great day cruising on the Pacific Ocean on a warm, sunny day. Small Alaskans sell today for about $120,000, a little more than Dan and Ellen paid for La Buona Fortuna. Their boat is kept in an open moorage, although now that they live ashore, they are thinking about finding a covered space. She has suffered some problems with rot, which have been repaired, and was to have been painted over the summer. The Alaskan has a large cockpit, with upholstered seating around the perimeter. Step through a large door into a generous lounge area, which flows into the galley. Steps down lead to a port stateroom with two big bunks and to a master stateroom forward (it has a double bed). There are two heads. The pilothouse is up a couple of steps from the saloon. It has a settee and watch berth, plus doors to the side decks. The wheel is amidships and visibility is good. La Buona Fortuna is a warm and cozy boat, something like mom&apos;s house. She is not a show boat and needs some cosmetic attention. But she is sound and in good health, with a pair of reliable Ford Lehmans and a diesel-fired heating system. She also has Vosper active stabilizers. 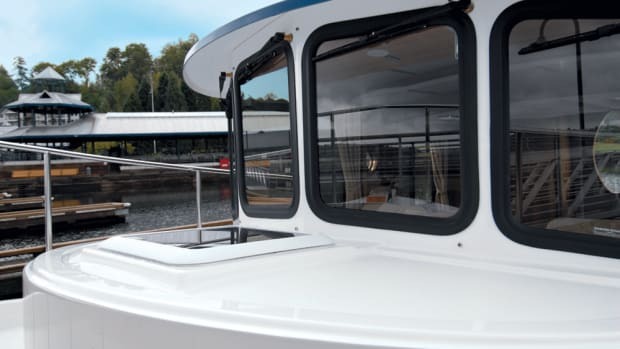 She still is childproof, with locks on cabinets, netting over the rails and a plastic cover keeping the toddler from slipping through a passthrough between the pilothouse and galley. There are seats for Christopher near the helm and in the galley. Although they live ashore, Christopher, 5, asks often if they are going cruising. And they often do. "We have had virtually no problems," Dan says. "We have put 1,500 hours on the engines in five years; we often take long cruising weekends, leaving on Thursdays and returning Monday morning. "Five years later we are very happy with our choice. It took a lot of effort to find it, but we are completely happy with La Buona Fortuna. I can&apos;t imagine selling and doing something different." Old GB woodies are definitely worth a look if the "affordable" factor is part of your search for your next cruising motorboat.